Years after she passed away, Julia Child is once again the talk of the town. I went to see the movie Julie and Julia this weekend, and quite enjoyed watching Julia Child's larger than life personality artfully brought to life by Meryl Streep. What I love about Julia Child has nothing to do with French cooking, really. It is the way she grabbed life with both hands and simply went on to do whatever she felt like, without being self-conscious in the least. V and I have spent so many lazy Saturdays going about our chores with the TV tuned to PBS in the background. We would be putting away the groceries and folding laundry as Julia Child chatted with master chefs in her trilling voice, Lidia Bastianich made gigantic vats of pasta and plumbers dispensed sage advice on This Old House. I love the cooking shows on PBS- they are so authentic and professional and infused with genuine love for cooking. Last week, I hauled home a mighty tome from the library- Julia Child's The Way To Cook, published in 1989, a cookbook that focuses on techniques. Don't you love illustrated cookbooks from the '80s? There is something utterly charming about the colors on the photos, the over-the-top garnishes and the layout of the food. The pastry and dessert chapters in this book had me completely mesmerized. 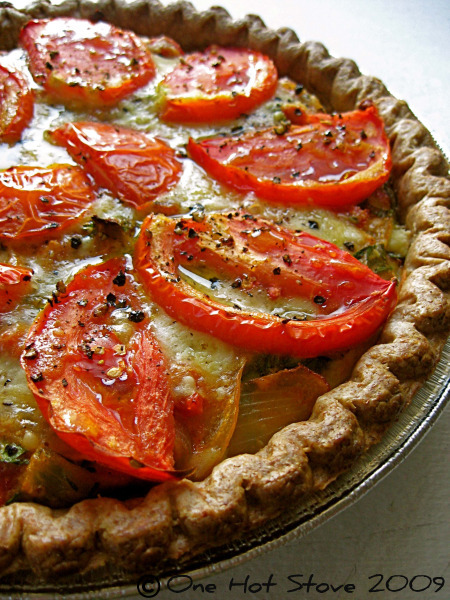 The recipe I chose was one that sounds perfect for the season- Provencal Tomato Quiche. It calls for pre-baking a pie shell, then layering it with an anchovy paste, a filling of sauteed onions and tomato blended with eggs, and a topping of parmesan cheese and fresh tomato slices. My two major modifications were- I did not want to use anchovies so I substituted olives instead, and I used a store-bought frozen pie shell. There, I said it. I do have several excuses for not making my own pastry dough! Take your pick: There was a heat advisory that day and I was loathe to spend a minute more in the kitchen than absolutely necessary. I was busy hoisting myself up a wooden ladder to see the roof-top herb garden of a nearby cafe (no joke). My lace scarf won't knit itself. But before you cast your judgement, I'll have you know that this chapter contains a paragraph called "To Prebake Frozen Store-bought Shells". So Julia has actually legitimized such behavior! 1. Pre-bake a pie shell. I used a 9-inch whole wheat pastry shell, defrosted it for 5-10 minutes, pricked it all over with a fork and baked it at 450 F for 15 minutes. until the onions are cooked but not browned. 5. Preheat the oven to 375 F. Assemble the quiche- layer the olive paste at the bottom of the prebaked pie shell, then pour in the filling, scatter the cheese and arrange the tomato slices ("tastefully", Julia instructs. I tried). Drizzle the top with olive oil and sprinkle with some salt and pepper. This quiche would be perfect with a fresh green salad. However, that evening, I had a bunch of vegetables that needed to be urgently dispatched, and as I had fired up the oven already, I simply roasted them and served them on the side. This quiche is divine. It is absolutely hearty and flavorful, a mouthful of summer. This post goes to Lisa at Champaign Taste, for her fourth annual Julia Child Birthday Celebration. Coming up next- lentils + butter + cream= ?? Stay tuned! The Quiche looks inviting, and I can imagine the flavors...too good. This looks fantastic. If my garden tomatoes ever ripen (!) I will be sure to make it. I love a simple quiche. I see those french beans with balsamic vinegar in the background..I had tried those and they turned out great too.. This looks so yum!! Nupur, did you just puree raw tomatoes or did u blanch them first and take off the skins and then puree them? I just loved the recipe! I'd like to try this one and I don't want too much or too little batter for the shell. Thanks. I too love and respect Julia Child for her capability of embracing life. It was amazing to know that she went to France at the age 36 and then started her culinary journey by enrolling herself in the cooking school and learning French as well. Before that she wasn't too much into cooking. I find that so amazing. I too watched the movie and loved Meryl Streep. I love what Julia did to bring French cooking to the U.S. and home cooks! I also love her ability to laugh at herself and her mistakes - really looking forward to the movie! ooh-Quiches are among my favorite foods! I have never actually made them at home- have only made crustless quiches - fritatta style and souffle. So will definitely try this soon. I forsee eating this for lunch in a day or too..:) Thanks! I have been dying to borrow one of Julia Child's cookbooks but they have been checked out with several holds on them (because of the Julie and Julia hype, I guess). I enjoyed watching Meryl Streep playing Julia Child but I wish somebody would make a food equivalent of the movie Sideways. I enjoyed Ratatouille but wished it had been slower with more food descriptions..lol. The Quiche looks amazing Nupur. The Julie/Julia Project was one of the first blogs that I started reading. Can Meryl Streep ever let us down? Can't wait to see the movie. those tomatoes are lovely. Can you believe I've never seen Julia's PBS show? I imagine Meryl Streep did a great job of portraying her. OMG!! looks fantastic!! am loving this quiche!! My very favorite Julia book is The French Chef -- if you have seen the oldest shows, you'd get a kick out of reading it. I love your sub. of olives for anchovies. If I am lucky enough to have any ripe tomatoes, I will have to try this as well. Just arrived home from vaca. to find the plants sprawling on the ground, so we shall see! i like the wholewheat pastry shell the most - but this quiche on the whole looks grand. perfect! I saw the movie too. I was a bit bored at some point. I think it has a lot to do with the fact that, I have never watched Julia child on TV (except for watching her one show for a Daring Baker's challenge). I knew who she was. So I was very curious to watch the movie. Now I want to watch some of her shows. My fav part of the movie was when Julie tries to make some dish, she messes it up and gets so frustrated that she sits on floor and starts throwing tantrum. I could totally connect with that ;). Quiche looks amazing. I have to try this. Nupur, first, thanks so much for taking part in the Julia Child birthday celebration. And your contribution is wonderful! That quiche looks gorgeous (I'm experiencing photography-skills jealousy), and you did arrange the tomatoes quite tastefully. The pie crust, although not homemade, looks really great; when you said it was whole-wheat, I realized it wasn't the everyday grocery-store variety (not that there's anything wrong with that, as Mrs. Child indicates!). I have The Way to Cook, too. It's a nice book. A nice, BIG book. 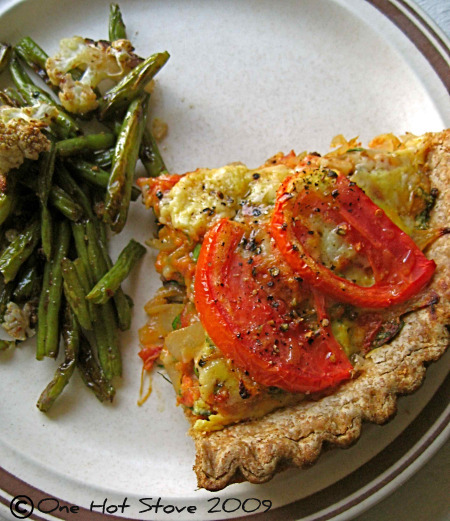 I've overlooked the Provencal quiche; must try it this summer. I'm with you on using the olives/tapenade in place of the anchovies, which I don't care for. One thing I loved about Julia is that she was always open to learning new things. I'm sure she would have been just as excited about a good quality convenience product as she was about discovering a talented new chef. Your tart looks lovely; Julia is smiling down upon you! the crust looks super pretty! What a gorgeous tart! I'm sure Julia would have loved it. And, I have to say, I'm quite happy to discover that Julia has given her approval to the idea of purchased pie crusts. Such a sensible idea, especially for this time of year! The quiche looks totally divine ! Amy- I fervently hope they ripen, because this would a delicious way to use them!! Mandira- Thanks :) The combination made for a very special dinner! Prachi- I'm so glad the roasted green bean recipe worked for you! Priya- In the filling, I actually used canned whole tomatoes that I chopped up. For raw tomatoes, you are right, they are to be blanched, peeled, seeded and chopped. Anon.- Standard 9-inch pie shell. I've edited the recipe to reflect that. Meera- Yes, it just goes to show, age is just a number, one can go on and achieve so much at any stage in life. Patsyk- I agree- she is just so human, not prim and perfect, I think many people can identify with that! Vaishali- So many gems to be found on Public Television, right?! Yes- the Julia Child cookbooks are very much in demand right now, I had to request this one from another branch of the library but they got it for me in just a couple of days. If you like movies about food, have you seen Like Water for Chocolate and Eat Drink Man Woman? Indosungod- I never read the Julie/Julia blog, I only read it when she wrote a book about it. In the movie, I focused on the "Julia" part and more or less ignored the "Julie" bit! Lisa (Show Me Vegan)- Meryl Streep did an admirable job playing Julia Child!! It called for very good acting skills. Linda- Oh no :( Your tomatoes missed you and pined away?? I hope they recover and they will find a good home in this quiche! The olives worked so well, giving this salty savory flavor to the dish. Alanna- Thank you :) We enjoyed every bite of it. Thanks for coming out on Sunday- I know how busy you are! Lisa- I am excited to see the round-up! It really is a massive book, something to study and master over time. I'm glad I tried this one recipe though- it made for a wonderful supper. Lydia- I agree, she never gave the impression that she knew it all, which is such an important attitude if one is to grow. Nags- That's thanks to Whole Foods, who made the crust! Diane- I think this is one of those timeless cookbooks which can be enjoyed for decades...I hope your reading group enjoys the quiche! This is a work of art, Nupur. Beautiful. I love how you vegetarianized it! hi, this looks really pretty.. wonder what could be subbed for the eggs? Any thoughts? I've read Like Water for Chocolate, but haven't seen the movie. Will check out the two recs. Thanks! The sound of this is giving me some serious cravings now. The whole wheat shell sounds soooo good. I have never seen her show on PBS!! Your Julia-inspired quiche looks FANTASTIC, Nupur!! BTW, just thought I'd let you know- the link to Julia Child's book leads to Shilpa's recipe- perhaps from your previous post? Looks so yum...would love to get recipe for the shell as well. Cause i don't have choice of buying frozen one. Thanks for your kolhapuri misal recipe. I combined your and your mom's style. it came out really well. pb- A web search for "vegan quiche" might give you some good ideas. I've seen silken tofu used instead of eggs. Lavanya- Hope you enjoy them! Soma- The whole wheat shell really worked well here! jayasri- worth trying, for sure. Thank you so much for pointing out the link glitch- I fixed it. Namita- Yup, dal makhni it is! Seema- Yes, this one was quite rich and filling too! Swarupa- Please do a web search for "pie crust" and you will get many recipe for the pie shell. Absolutely beautiful quiche! 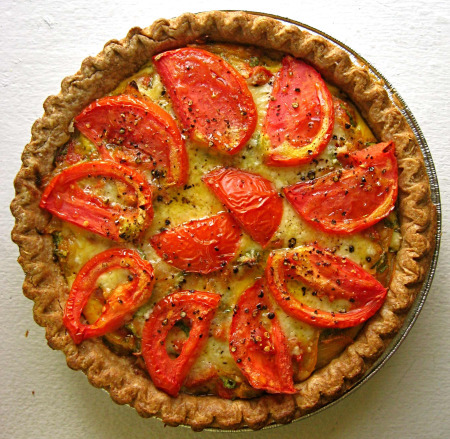 I have many tomatoes from my garden that i must use up so I think I will amke this quiche this week. I took part in the JC celebration on Lisa's blog also, but with a blog post I published in May for Potato Leek Soup. I do love old cookbooks and Julia's are treasures! Pat- How wonderful that you have your own home-grown tomatoes on hand! I agree- Julia's cookbooks are treasures. Johanna- I think you will enjoy the movie! I am making this quiche tonight and I have a question about another modification of the original recipe. Julia's recipe calls for chopped fresh tomatoes in the filling and you used tomato puree. I'm worried about the puree making the quiche red and soupy. Can you assuage my fears? Thanks! I just made this recipe after seeing it on Pinterest. I used your called for "2 cups tomato puree" and not only is my mixture very red as compared to your photos, but it filled TWO 9" store bought crusts. (Not so very surprising, now that I think about it.) I looked up the original Julia Child recipe and it calls for an optional TABLESPOON of tomato paste. I hope my two quiches turn out all right. I'm rather angry right now. I guess it's my own fault, but I feel I shouldn't have to research a recipe before I make it, particularly one that's so popular. I'm really surprised this recipe has been up for so long with this error. God, I hope my dinner turns out at all. There's no mistake- I did add 2 cups of tomato puree. However, I did cook the mixture until the puree reduced to a jam almost (cooked off the water). What would you suggest to use in place of the olives? AMAZING! I am trying this recipe next week. It looks so yummy! I just made this recipe and it was so good! Thanks for sharing! I love anything provencale..yum!